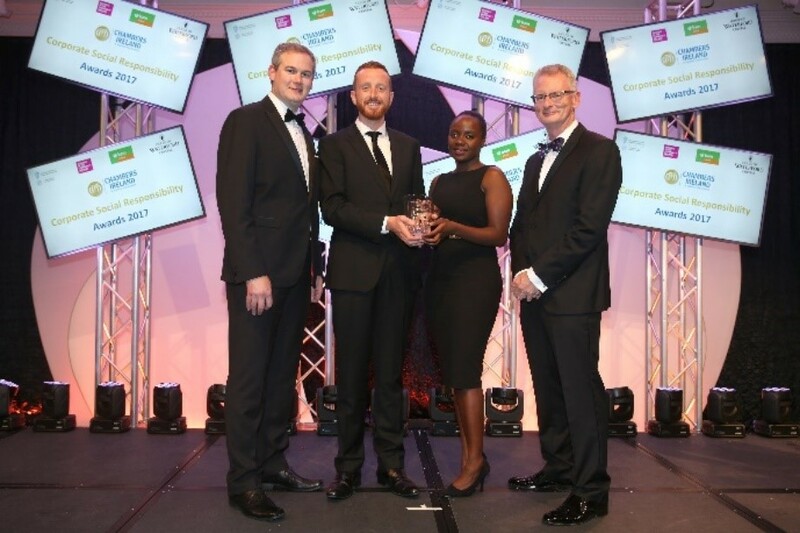 In 2004, the country’s largest business organisation established the Chambers Ireland CSR Awards to encourage Corporate Social Responsibility (CSR). The awards feature excellent CSR initiatives by Irish and multinational companies, and promote sustainability and responsibility in business. 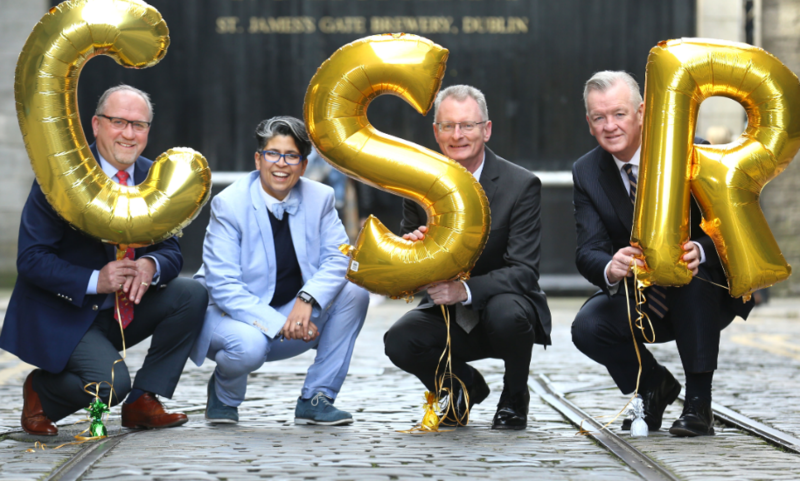 Ian Talbot, Chief Executive of Chambers Ireland, observed that the growth of the CSR Awards over the past 14 years represents an increasing emphasis on responsible practices and community engagement. Given the current direction of global political and economic discourse it is more important than ever for Ireland to showcase strong commitment to the Sustainable Development Goals. This year’s Chambers Ireland CSR Awards ceremony took place on 7th September. More than 50 organisations were shortlisted for 75 projects, across 14 categories. Among them, TWi’s Charity and Community Involvement (CCI) committee was shortlisted for its partnership with Cork Simon. Brian O’Neill, CEO of TWi, attended the event with Dermot Kavanagh, CEO of Cork Simon, and Kate Twomey, a TWi Service Delivery Team Lead and member of the CCI committee. To some extent, we’ve come to expect innovative social programmes from the large national and international firms. But the scale and diversity of the projects undertaken by such companies was impressive. However, what really struck me was the number of smaller indigenous firms taking part, and the impact they’re making. There’s a momentum building behind the concept of CSR in Irish SMEs. It’s really exciting that structured CSR programmes are giving expression to socially conscious individuals and focusing the efforts of like-minded people. In 2015, TWi set up its internal CCI committee to develop a structured CSR strategy. TWi founder and Chairperson, Patrice Fanning, drove the initiative, motivated by her commitment to embedding CSR within the company’s ethos. The CCI committee combines the available company resources with the time of willing employees, collaborating with charity partners to deploy them to maximum effect. Following consultation with staff and various charities, the CCI committee rolled out a CSR plan for 2015-2016 focusing support on Autism Assistance Dogs Ireland and Cork Simon. Initially, TWi approached Cork Simon to express interest in supporting them with money, time, and professional skills. Subsequently, a collaborative partnership evolved, based on the synergy between the two organisations and the people involved. Dermot Kavanagh noted that TWi and Cork Simon share a care and concern for people and a commitment to fighting homelessness. It’s clear from TWi’s support for so many different aspects of our work that they share our belief in people and our belief that those experiencing homelessness deserve better. TWi has allocated a portion of its annual profits to contribute financially to initiatives undertaken by Cork Simon. However, the core focus of the partnership is on developing and supporting employee engagement in the Cork Simon initiatives. Through the partnership, TWi employees have assisted Cork Simon through fundraising, volunteering, and raising awareness. 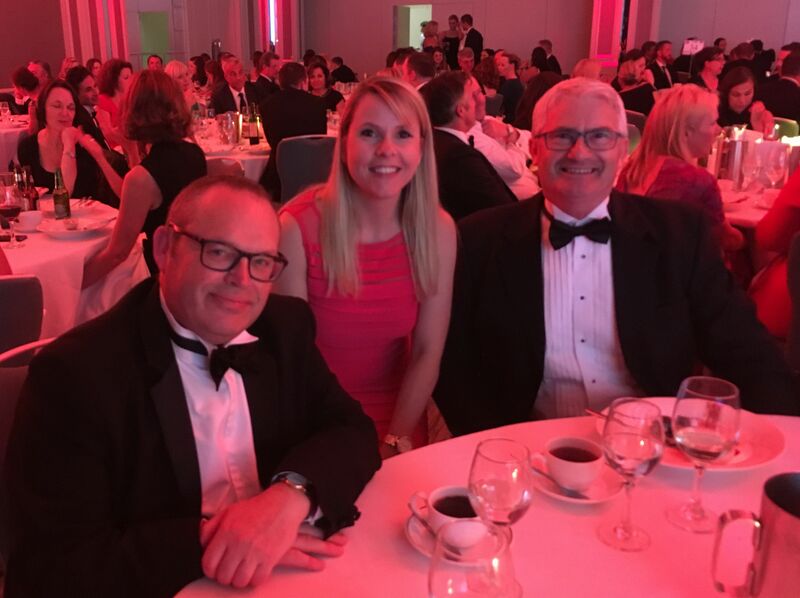 Dermot Kavanagh, Kate Twomey, and Brian O’Neill at the 2017 Chambers Ireland CSR Awards ceremony. Brian says that he’s very proud of the partnership and delighted that it has achieved the recognition of being shortlisted for the Chambers Ireland CSR Awards. Moreover, he feels that the experience has further strengthened the highly valued relationship with Cork Simon. We’ve been hugely impressed with the warmth and professionalism of Cork Simon. They show humanity and respect in delivering emergency shelter, personal development, and social reintegration services. We’re humbled to be associated with their work. Earth’s Edge won the ‘Excellence in CSR by an SME’ award for their ‘Kilimanjaro Equipment Lending Programme’. Congratulations to the Chambers Ireland CSR Awards for their role in promoting CSR in Ireland. To all the firms that won awards, were shortlisted, and put themselves forward: well done to you! I applaud our fellow finalists in the ‘Excellence in CSR by an SME’ category, which was won by Earth’s Edge. Most of all, I commend the wonderful NGOs diligently working to harness CSR as a resource – as individuals and as a society, we’re indebted to them. TWi’s CCI committee continues to support Cork Simon, along with a new charity partner, Pieta House. The partnership between TWi and Cork Simon is just one example of how businesses and charities can collaborate in a sustainable, mutually beneficial way, to address social and environmental issues. Cork Simon works in solidarity with people who are homeless in Cork, offering housing and support in their journey back to independent living. The organisation is part of a network of Simon Communities in Ireland delivering services to over 5,000 individuals and families experiencing at risk of homelessness, annually. We encourage you to learn about their work, find out how you can get involved, or make a donation.